Typically, companies tend to introduce new technologies with their high-end products (either enthusiast or enterprise) and then adopt them for their application-specific and mainstream client devices. Over time, what once was an exclusive feature of ultra-high-end products, becomes an integrated part of mass-market parts. This might be the case with helium-filled hard drives, according to Seagate. The density of helium is seven times lower than that of air. It allows hard drive makers to install up to seven platters into standard 3.5” HDDs. It also reduces power consumption, thanks to lower resistance for the movement of the heads and the platters and higher capacity per 3.5-inch unit. The lower motion resistance also aids in improving the accuracy of the positioning of the heads. HGST introduced helium-filled HDDs for cloud datacenters in 2013 and this year Seagate announced its first 10 TB helium hard drives targeting the same market segment. Helium has enabled both vendors to increase capacities and reduce power consumption of some of their enterprise-grade HDD product lines. As the implementation suggests, Helium based hard drives are sealed units. Back in November, Seagate disclosed that its experiments with helium began in early 2000s and the company had 12 years experience with the technology. Mark Re re-affirmed that Seagate was indeed very familiar with helium and that its sealed platform was robust. However, this does not mean that it intends to use it across many product lines. In fact, as of now, Seagate does not even have a marketing name for its hermetically-sealed HDD technology (unlike HGST's HelioSeal nomenclature), an indicator that helium-filled hard drives from Seagate are not currently aimed at consumers. Update: While Seagate has yet to announce a complete roadmap to their helium drive efforts, after publishing this article I’m hearing that this may soon be changing. In which case we may finally see helium technology further diffuse into consumer, mass-market drives. 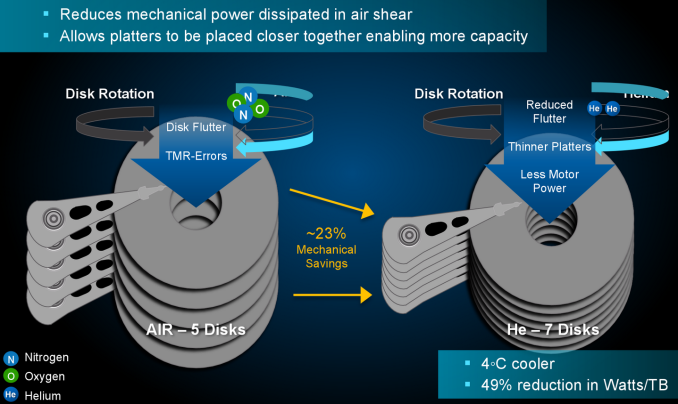 While filling hard drives with helium helps to position heads more accurately (something expected to become more important as tracks get narrower), Seagate has also reduced fluid flow forces inside HDDs using purely mechanical solutions and plans to continue refining its technology. Therefore, helium is not a must for the next-generation hard drives that employ HAMR, TDMR or other technologies that improve areal densities with smaller and narrower pitches and tracks. Western Digital, on the other hand, recently introduced its new helium-filled WD Red, WD Red Pro and WD Purple hard drives for consumers, SMB and video surveillance applications. In addition, their new single-bay external DAS (direct-attached-storage) solution (My Book 8TB) is also using a 5400 RPM helium drive. This is a clear indicator that HGST’s helium technology is getting more affordable. Seagate believes that maximization of capacity per drive (per rack and per square meter, to be more precise) and minimization of power consumption are the two features of importance to data centers (which is why seven platters per HDD and lower-power motors make sense). Meanwhile, as things like fluid flow forces can be mitigated using various other means, usage of helium inside HDDs outside of capacity-demanding applications is not justified right now, according to Seagate. In our discussions, Mark asserted that it does not make a lot of financial sense to develop helium-based HDD platforms for applications that do not require maximum capacity. Though, bear in mind that large corporations like Seagate are always developing a variety of technologies and platforms and can use them when the time is right. Therefore, if Seagate sees no value in helium for non-leading-edge HDD platforms at this time, it does not mean that the company cannot introduce inexpensive helium-filled HDDs in the future. To sum up, at present, usage of helium inside the Seagate Enterprise Capacity 10 TB HDD gives the company a high capacity product for enterprise applications. However, Seagate believes that helium is not something that is needed outside of capacity-demanding applications at the moment. While Seagate did not disclose its helium roadmap to us, Mark Re made it clear that that the company does have one. Sure, you can try to mitigate the performance, but I feel the initial performance design should have been aiming higher than existing PMR performance. That's why SMR is disappointing to me. I feel like they were dumping R&D into HAMR, and they weren't getting results as fast as they wanted. So they go the SMR route to get the desired results (more storage density) in the interim. It's not like SSDs. While SSDs were lower in capacity initially, the speed increase was dramatically better. SMR-based drives are only slightly better in capacity, but they are more noticeably worse in performance. Thus it didn't have the same impact - it doesn't have enough of the "wow" speed factor to help overlook its performance shortcomings. Well, SMR is a stopgap solution, but it's here now and it works. HAMR sounds great on paper, but show me where I can buy an 8 TB HAMR drive today, for under $250? Even as an individuaI, I mostly don't care about storage performance. OS and apps and "live" data files get an SSD. That <5% of my storage. Media, archives and backups get an HDD. That's >95% of my storage. I don't care about performance for SSD nor HDD, both are OK for the uses I dedicate them too even in their cheapest crappiest incarnations.